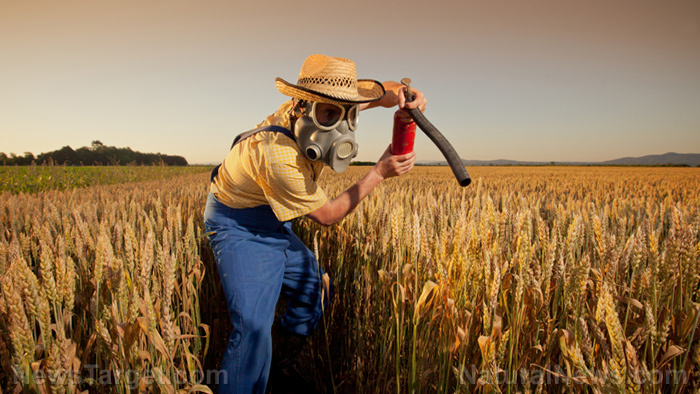 (Natural News) For truth news seekers and Constitutionalists, Trump couldn’t be a better POTUS, but for protecting the environment, clean food, and the animals responsible for 75 percent of all U.S. food, he’s falling short – or so the fake news media would have us all believe. Limited farming for the purposes of wildlife food and habitat is permitted in dozens of U.S. wildlife refuges, but genetically modified crops, such as GM corn and soy, were not, unless addressed on a case by case basis, according to an Obama-era ban. The worst part of the “memo” is that it allows cancer-crop farmers to use neonicotinoids (neonics) – a class of insecticides proven by research to wipe out entire populations of pollinating insects, including bumble bees, honey bees, wasps, butterflies, dragonflies, and even frogs, birds, bats and aquatic life. These animals are responsible not only for the majority of the world’s food, but the survival of 90 percent of our wild plants. If the bees are wiped out, say goodbye to watermelons, lemons, limes, squash, tomatoes, pumpkins, zucchini and kiwi, among others. To pour salt in the massive wound, the same food we eat is sustenance for the mammals, birds and insects on the wildlife preserves, so allowing GMOs and poisonous insecticides is like passing laws that allow animal genocide. However, thanks to Mike Adams the Health Ranger, the research was done to expose fake news, find the two memos, and show that Trump isn’t the culprit here, even though he could stand to make some major food and agriculture reforms down the road. Trump basically left most of the language the same, but the fake news saw a little angle they could exploit, to make it look like all of the sudden Trump enabled all of our wildlife preserves to be pummeled by insecticides and GMOs. It’s true that chemical agriculture is the polar opposite of pristine wildlife reserves, but the Fish and Wildlife Service Deputy Director, Greg Sheehan, couldn’t care less. Sheehan, along with U.S. Interior Secretary Ryan Zinke, think the only way to grow anything on a wildlife preserve is to genetically infuse weed-killer and bug-killer into the plant seeds and genes, and then spray more chemical-laden pesticide toxins all over them. They think it’s good for the expansion of hunting ducks and geese – their main (and only) goal for the Fish and Wildlife agency. Wildlife refuges exist and persist just fine without GMOs or neonics. Still, the memo leaves it open for case by case judgment for GMO and toxic neonicotinoid use in 50 national wildlife preserves across the U.S. that cover 150 million acres of land. Environmentalists in Canada warn us all of a major ecosystem collapse if farmers keep using neonicotinoid insecticides. If you notice the root word “nicotine” in neonicotinoids, that’s because the insect killer is a neuro-active chemical similar to nicotine. The toxins aren’t just being consumed by wild bees either. Now they’re showing up in rivers and lakes, as their application has more than doubled over the past two years in agriculturally dense areas. The science of GMOs is NOT settled – they’re not safe or effective, but rather experimental and dangerous. According to the environmental minister for Ontario, Glen Murray, neonics are a bigger threat to the ecological integrity of the world than DDT. He’s says they’re much more toxic and have been banned for nearly 50 years in all of Canada due to safety and environmental worries. The chronic damage could even be far worse than already observed. Why? One of the major problems with neonics is that they are persistent and stay in the soil for years. Eugene, Oregon and Spokane, Washington have implemented bans on toxic neonics being used on city property. Tucson Arizona says they’re next to ban it. Ontario Bee Keepers Association says they’ve already lost more than half of their beehives just last winter due to the use of neonics. American farmers don’t even recognize the possibly irreversible impact occurring from neonic application. These poisons are applied to the seeds and then taken up into the plant’s tissues, even when only applied in parts per billion. Plus, since neonics are water-soluble, the roots absorb the insecticide. Next, the poison only stays on the plants for about 3 weeks, and then it washes into nearby waterways. Environmentalists across America better step up and push for the U.S. government to ban neonics before they destroy our entire ecosystem, our nation’s pollinators, and the majority of our food supply.